European corn borer (ECB) adult activity is very low. Areas of highest activity continue to be in the central counties, and particularly Mercer County (see ECB map). Much of the ECB feeding that is currently in corn is overshadowed by FAW damage. As always, consider treating when the number of infested plants in a 50 plant sample exceeds 12%. Any planting remaining at or above threshold as it proceeds to full tassel should be treated, as this is the last stage at which ECB larvae will be exposed and vulnerable to insecticidal sprays. See the 2016 Commercial Vegetable Recommendations Guide for insecticide choices. 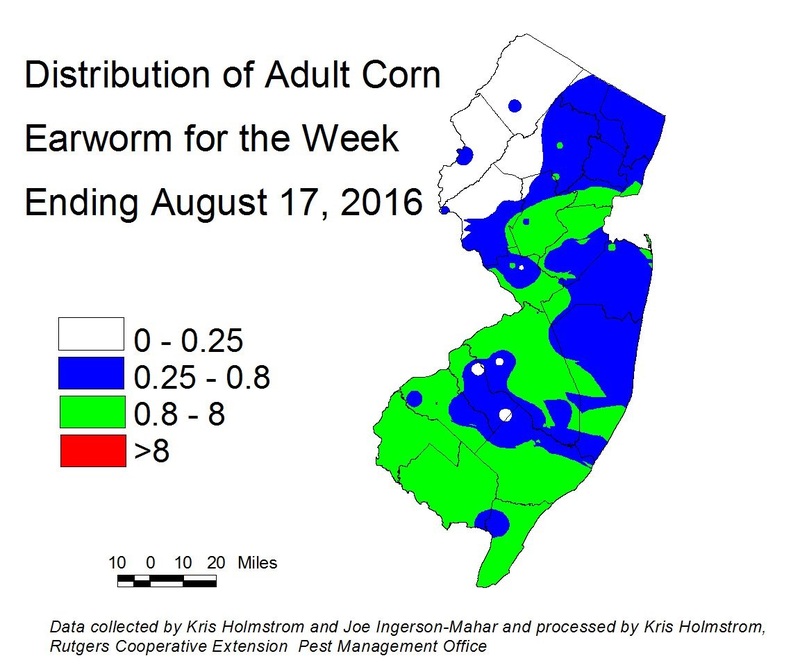 Fall armyworm (FAW) infestations continue throughout NJ, with high infestation rates now appearing in all parts of the state. This pest can be devastating to small corn plants, and in fact the worst infestations are currently in shorter whorl stage plantings. Fields down to seedling stage should be scouted weekly for signs of infestation. Treat when FAW alone or in combination with ECB damage exceeds 12% plants infested. FAW do not respond well to pyrethroid insecticides. The most useful products are those in the IRAC group 28 class (Coragen, Exirel, Belt) or the IRAC group 5 class (Radiant, Entrust), or combination products including these classes. See the 2016 Commercial Vegetable Recommendations Guide for insecticides effective against FAW. Corn earworm moth (CEW) activity has increased significantly over the weekend. While the increases are geographically inconsistent, a number of blacklights registered much higher numbers since late last week. The higher catches are generally in the western half of the state, but increases have been detected all over NJ (see CEW map). Catches in DE are lower than some of our NJ catches; particularly in the western NJ traps, hinting that some of these moths may have come from more westerly sources. This current population is still lower than we traditionally get in mid-August. More CEW may continue to arrive in advance of frontal low pressure systems. Growers should be checking CEW activity frequently, and adjust spray schedules according to local activity. The limited CEW pheromone trap network in the southern counties also increased over the weekend. As with blacklight traps, catches are not geographically consistent, although numbers are much higher overall (see CEW pheromone map). The low number of traps results in broad areas of color within the map. It is critical that growers monitor local CEW moth numbers. At present, this population constitutes a significant threat to silking corn. 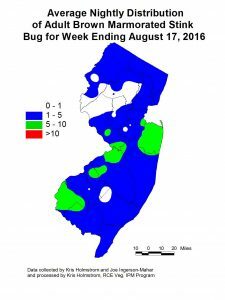 BMSB numbers increased in many NJ blacklight traps this past week. Higher activity may be found into the central counties now. Hot weather may be causing adults to be more active, and nymphs have been discovered in pepper and corn plantings. It is important that host crops like peppers be scouted regularly for the presence of BMSB and other stinkbugs at this time. It is often most productive to walk slowly down pepper rows, scanning plants ahead. BMSB and other stink bugs tend to bask near the tops of plants, especially in the morning hours. Down y mildew (DM) is present on cucumbers in all parts of NJ (see photo at left). DM has been reported on the eastern shore of Virginia on butternut squash. 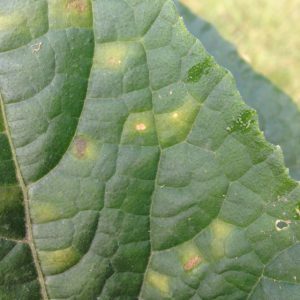 While this site may not currently be a direct threat to NJ pumpkin and winter squash acreage, it is an indication that races of the pathogen that are capable of infecting these important crops are getting closer. All growers should be applying appropriate protectant fungicides plus DM specific materials to cucumbers and cantaloupes at this time, and preparing to do the same on pumpkins and winter squash (See Dr. Andrew Wyenandt’s Cucurbit Downy Mildew Update in today’s Plant and Pest Aevisory). DM lesions appear as yellow areas on the upper leaf surface with leaf veins making distinct borders to the lesions. On the lower leaf surface, beneath the lesions, dark spores may be seen if conditions are moist. For more information on the regional presence of DM as well as comprehensive, weekly forecasts, see the following website: http://cdm.ipmpipe.org . At this time, NJ is at elevated risk for further spore deposition and infection from sources to the south and west according to the Cucurbit Downy Mildew Forecast. 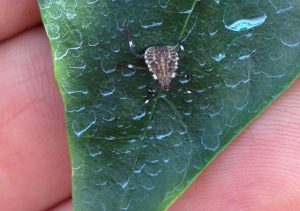 Stinkbugs continue to be found in scouted fields along with two-spotted spider mites (TSSM). This latter pest is particularly favored by the heat we are now experiencing. Check fields regularly for the appearance of yellowing on leaves, or whitish pin-spots. Both are indications that TSSM may be present. If TSSM is present, the actual mites will be found on the lower leaf surface. It is best to treat for TSSM before the population gets too widespread. Spot treatments may be adequate to achieve satisfactory control. There are a number of good miticides available, and growers should choose products based on efficacy and pre-harvest interval. See the 2016 Commercial Vegetable Recommendations Guide for miticides effective against TSSM. If stink bug fruit injury is increasing in harvests, or stinkbug adults, nymphs (see photo at right), or eggmasses are found in more than one of 10 samples in a field, consider treating for this pest to limit injury. See the 2016 Commercial Vegetable Recommendations Guide for insecticides effective against stinkbugs. No weevils were trapped in the past week. As far as known, there are no infested fields.